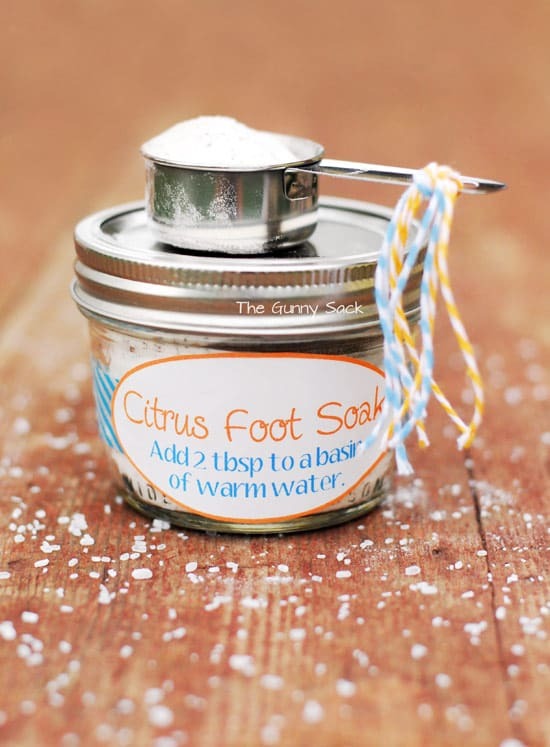 This homemade citrus foot soak recipe is a relaxing way to pamper yourself! It is fun to give as a gift in a jar or can be made in a large batch for a spa party. This homemade citrus foot soak was one of the gifts in a jar that I gave to my mom for Mother’s Day. It goes along with the Orange Creamsicle Sugar Scrub. I also gave Coconut Body Butter along with it because I had already made it. If I were planning to make all three of these for a spa party or as a gift in a jar set, I would choose an orange scent for the lotion such as Capri Seaside Citrus from Bath and Body Works. I am planning to use all three of these homemade spa products on my feet to to try to get them looking good for sandals. I know in some parts of the country, you’ve been wearing sandals for months but I just took mine out this week! 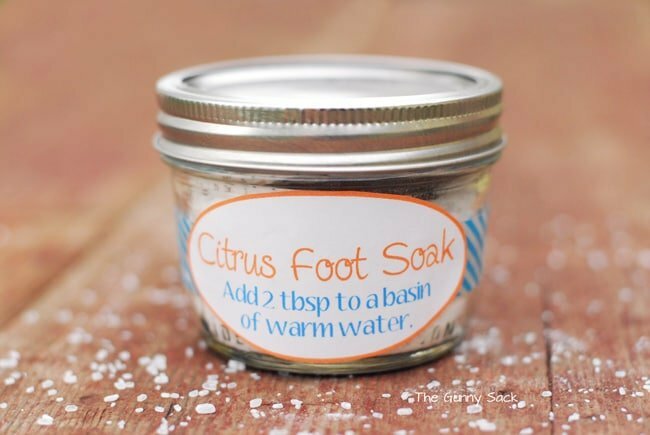 To make this citrus foot soak, I used orange essential oil, orange tea, baking soda and Epsom salt following the recipe I posted last winter from my spa party for a Peppermint Tea Toot Soak. This time I added the essential oil to increase the citrus smell. The fresh, citrus scent or orange is lovely for summer and brings happiness to mind while helping to relax. Epsom salt helps eliminate toxins in the body and baking soda helps soften skin. 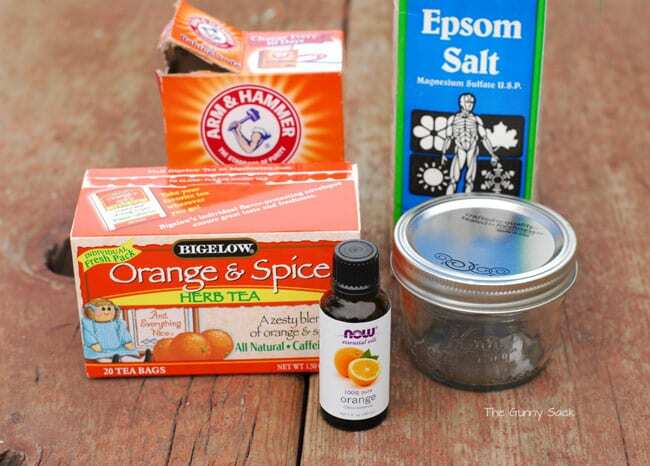 I used 1/2 cup of baking soda, 1/3 cup Epsom salt, the contents of 2 orange tea bags and 5 drops of orange essential oil. 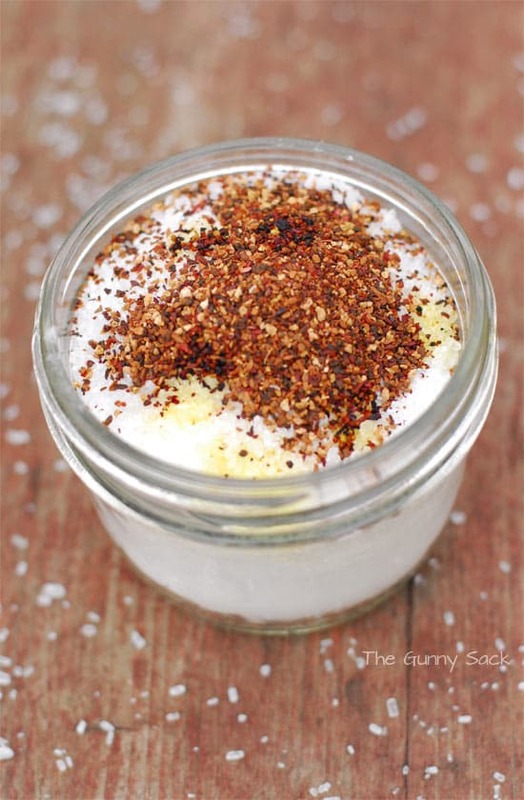 Put it all in an 8 oz mason jar or a bowl and stir it up. 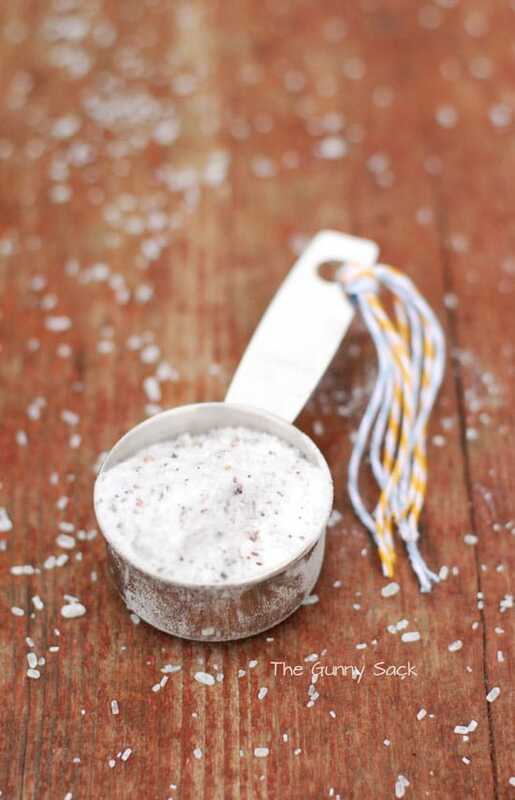 Add 2 tablespoons of the foot soak to a basin of warm water and soak your feet while you relax! If you are giving the foot soak as a gift, add a scoop and tie a few pieces of colorful baker’s twine to the end. First of all…congratulations! Since none of the ingredients are perishable you should be able to make it as soon as you want. The only thing I’ve noticed when I’ve used a foot soak that has been in my cupboard for a longer period of time is that the scent fades over time. Best of luck! This is a super great idea!! But how long do I need to soak in it? It’s really up to you but I usually soak my feet until the water gets cool. If I’m really enjoying it, I will top it off with more hot water and soak longer. Enjoy! this is perfect for a gift basket i’m making for my mom. thanks! must I add essential oil? wouldn’t olive and coconut oils be enough? Is baking, cooking soda the same as baking powder? Thanks. I have had the worst six months you could imagine, ending with my husband loosing his job. We are surviving on mine [job/income, that is!]? I love making andgiving gifts, and with Christmas coming, it will be a frugal one. Fortunately, there is nothing I like better than making gifts! Your site will help me extend the homemade gifting… The ideas for males etc was one I did struggle with. Thank you for all the inspiration you have given me. I’m wondering what the tea is for exactly? I have lavender Epsom salt and plain decaf black tea bags and I’m wondering if I could use that instead of what you have here. Tea is supposed to help foot odor. It also adds a delicious scent to the foot soak but you can leave it out and just use your lavender Epsom salt. Where do you get the little spoons, or scoops at? I bought the scoops at Walmart. They are in the aisle with the other kitchen utensils. Just wanted to know what kind of oil you used and where you got it.. Thanks!! Hey Andrea, you are asking about the essential oil? I used Now Essential Oil and I bought it from Coburn’s Grocery Store. Have a great weekend! These is the best gift because you can make some for you and some to give as a gift!! It sounds perfect with the tea. I might pull out a few that I didn’t really like to drink to try as a foot bath. YUM! Thanks, Alison! Sounds like a great idea! Great gift idea; we have tons of June bdays coming up! I totally need to make one of your scrubs Tonia! They are all fantastic! This sounds like a perfect way to be pampered right now!! A spa party! That sounds like such a fun thing to do with girlfriends! Um, how cool is this?! My mom is alwaaaaays trying to give herself little pedis at home to save money, so what a perfect little soak for her! I just love this! I’ll be making these up for myself as well as gifts for friends and family. 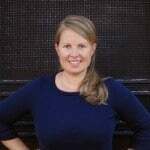 Fantastic idea – thanks Tonia. Thanks Di! I’m sure they will be delighted! Yes, just make a double batch! One to give and one for you! I’m not the DIY kind of girl but this looks very easy. I love the idea! Bliss, now if I can teach the three year old to rub my feet….